Black Sheep Creative understands that coming up with that unique corporate or special occasion gift is difficult. What was popular last year might not cultivate excitement this year. So in addition to the custom products/projects that we create from scratch, we have researched which companies provide the highest quality laser engravable items and have partnered with them. Below are links to various catalogs that might help spark the idea for your next project! To start your corporate gift project today or for a quote, call 512-415-0898. Black Sheep Creative is proud to partner with JDS Industries and provide our customers with access to their vast catalog of personalization options. Below we have linked to websites that expand on corporate gift options that BSC can use as a starting point for your unique project. Note: If while browsing the catalogs, you come across items of interest, just jot down the part numbers and use the contact form at the bottom of the page to let us know which items you want a quote on. 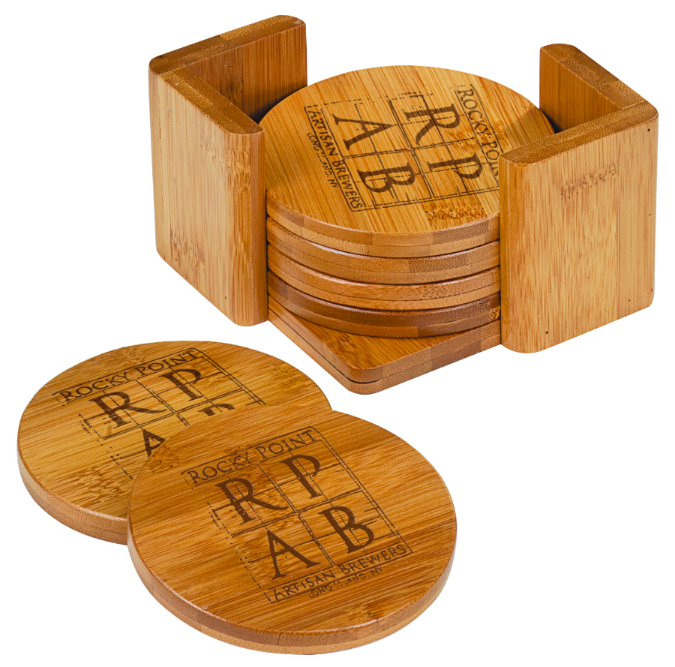 Bamboo coasters make an elegant gift when engraved with your corporate logo. Call 512-415-0898 to find out how we can personalize your items today!